The original LEGO Mindstorms Programmable Brick. Use this tag if your question specifically relates to Mindstorms Robotics Invention System 1.0, 1.5 or 2.0. 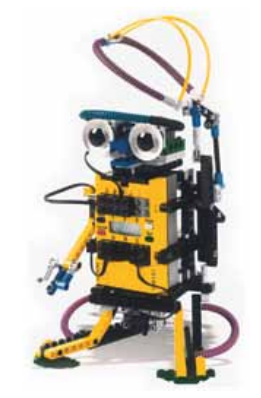 Released in 1998 as part of a collaboration with the Media Laboratory at Massachusetts Institute of Technology, the RCX Brick was the core element in the mindstorms Robotics Invention System. It was succeeded by the nxt which was released in 2006. It had 3 inputs and 3 outputs, as well as a tone-based speaker and small numeric LCD Display, and the brick was based around the LEGO System elements. Programs were downloaded to the RCX brick via Infrared through a Serial or USB Tower. It came with the its own programming software, but a variety of unofficial languages exist, such as NQC, and leJOS NXJ. How can I connect the RCX 2.0 to an external power source?